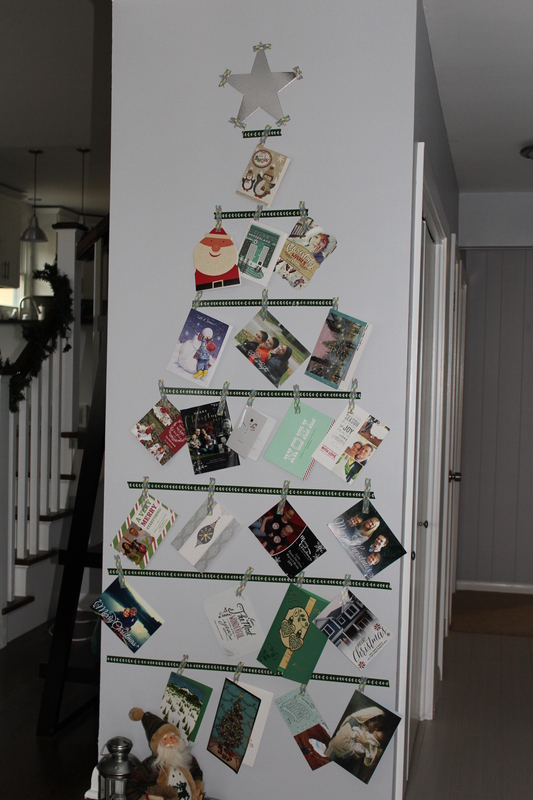 I have a quick post for you today to show you my growing Christmas card tree. When we were at the apartment, we would hang our cards on a string over the bar area where there was an alcove. Unfortunately, I have no photos of it. I’ve trying to figure out how to display all the lovely cards we’ve received this holiday season. The still blank wall in our entryway silently mocks me every time I walk by, so I thought I could do something with that space. Especially something not permanent for the holidays. Enter washi tape. I used 2 different tape patterns – 1 to tape the star and as ornament “hooks” for the cards, and 1 to make the “branches” of the tree. The tree could use a couple more cards, but I’m sure we’ll get more cards in the next few days. This Christmas card tree brings a smile to my face every time I walk in the door. It’s not too late to make your own!